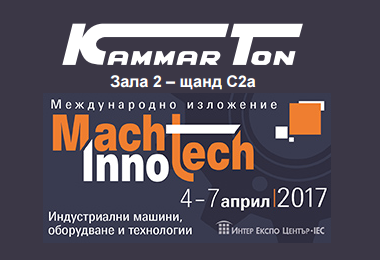 Kammarton Bulgaria will take part in the international exhibition MachTech & InnoTech from 04. 04 to 07. 04. 2017. You can visit us in Hall 2, stand C2a, Inter Expo Center - Sofia. We will introduce the latest innovative technologies in welding, the metal-cutting and metal-working machines, the robotics, the marking machines, the specialized equipment and supplies. ESAB - Equipment and supplies for arc welding and plasma cutting. SELCO - Machinery and accessories for all types of welding. Bernd Siegmund - Specialized welding and working tables. AXXAIR - Solutions orbital cutting, chamfering and welding of pipes. PLYMOVENT - Extraction systems for welding gases. DENER Makina - CNC hydraulic bending machines for bending, NC and CNC cutting machines for metal laser systems for cutting, plasma gas oxygen portals sheet metal. YASKAWA MOTOMAN - robotics systems for arc welding, assembly, coating, dispensing, material handling, cutting, packaging and spot welding. PROMOTECH - professional power tools, automated welding equipment and industrial systems. PRYOR Marking Technology - Marking machines, point by scratching and laser marking. BAHCO - focus on the Sandflex® bi-metal blades, sockets set and accessories. You can visit us for free - register online until 00:00 on 3 April and present the registration barcode to the entrance or print and fill the invitation - you can download it from here.